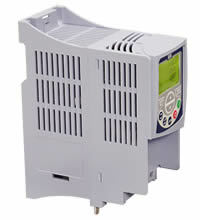 The CFW-11 is a variable speed drive series with state of the art technology for three-phase induction motors. It can be used in a wide range of applications, since it is designed for running on either Normal or Heavy Duty loads. Its performance is excellent, providing increased productivity and an improvement in the quality of the process in which it is used. Innovative and simple The CFW-11 presents many innovations that are helpful and beneficial to customers, mainly due to the simplicity of its installation and operation. The CFW-11 was developed based on Plug-and-Play philosophy (connect and use) allowing simple and fast installation of the VSD and its accessories. The Keypad has a navigation and programming system similar to mobile phones, with softkey buttons. It is possible to access the parameters sequentially or through groups of parameters. The Keypad also makes the Oriented Start-up function available, guiding the user through the necessary programming. Flexibility The CFW-11 adapts itself to the customer's needs through a broad range of accessories, which are easily installed. Besides this, the standard product comes with the SoftPLC function that attributes PLC functions to the VSD, which allows the customer to create his/her own applications (user programs) through the WLP software (programming in LADDER). - The cooling fan can be quickly removed and remounted for cleaning / replacement. 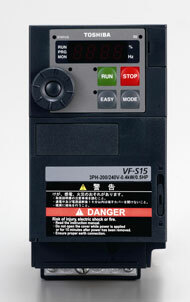 VF-S15 is a compact TOSHIBA drive designed for powerful performance in wide ranging applications. It is a sensorless vector control drive providing high torque throughout the speed range. 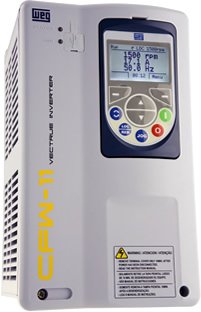 VF-nC3 is the series of compact and easy-to-use TOSHIBA inverters for small-sized machines. - Conveyer, automatic warehousing systems, etc. - Bread-makers, confectionery machines, tea manufacture machine, wheat vermicelli making machines, rice/wheat-polishing machines, mixers, slicers, grading of fruit machines, etc. - Fans and pumps for industrial machines, buildings, water supply and drainage systems, dryers, etc.